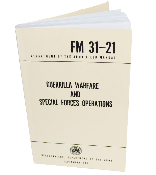 This manual provides guidance in special forces and unconventional warfare operations for commanders and staffs at all levels. The basic concepts of unconventional warfare are presented in a manner designed to acquaint the reader with special forces organization, concepts, and methods of operations to fulfill the Army's responsibility for the conduct of unconventional warfare. Chapters include fundamentals, control of operations, control of administrative and training activities, logistics, intelligence, communications, organization and development of the area command, and more.